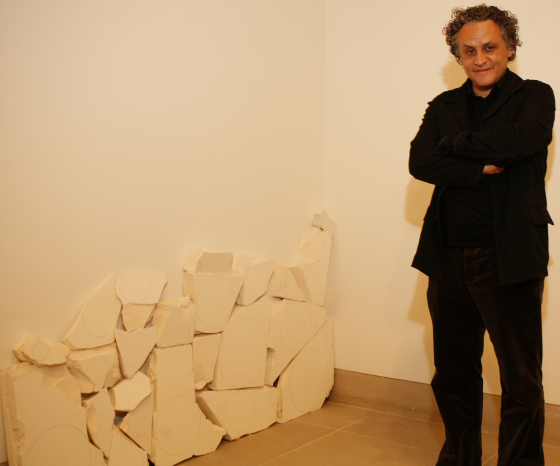 Gabriel Orozco was born in 1962 in Jalapa, Veracruz, Mexico. He studied at both the Escuela Nacional de Arte Plasticas in Mexico City (1981-84) and the Circula de Bellas Artes in Madrid, Spain (1986-1987). Invited by the Artists-in-Berlin Residency Program of the German Academic Exchange Service (DAAD), Orozco also lived and worked in Berlin as a DAAD Artist-in-Residence (1994-95). Within homes in New York, Paris, and Mexico City, Orozco does not maintain a studio. Interested in the accidental, he uses this freedom and his constant mobility to create art on-site, responding directly to gallery spaces and outdoor environments. An unpredictable artist, Orozco approaches his work in a seemingly casual manner, and yet, his varied body of work- which includes sculpture, video, installation, happenings, and photography- suggests that he is an artist who thoughtfully observes his surroundings to create conceptually based work that teems with formal beauty. Like a 19th-century observer of urban life called a flâneur, Orozco strolls the streets of the cities he inhabits, photographing everyday, discarded objects from the urban and industrial landscape either as he discovers them or as ready-made assemblages he has created. A lover of games, and a chess player since age eight, Orozco often invents his own rules in his art and incorporates elements of play into his work, inviting viewer participation with his sculptures and installations. Also influenced by geometry, his work is permeated with circles, appearing in both literal and compositional forms. An important figure in the international contemporary scene, most especially in Mexico City, Gabriel Orozco recontextualizes an everyday visual vocabulary through careful observation to engage viewers and change perceptions. Caitlin Topham, "Biography," in Gabriel Orozco: Inner Circles of the Wall (Dallas: Dallas Museum of Art, 2007), n.p. Watch a short video of the artist discussing his work.